Have you ever considered what it means when a group undergoes a change? It is not the organisation that changes – it is the behaviours of the team members – the individuals. It is the change in collective behaviour that produces different outcomes for the organisation. In organisational change, it is not the restructuring that represents the change, it is the shift in the accountabilities and responsibilities for each person. Different business outcomes are achieved as a result of the new behaviour patterns that are adopted. In a nutshell, it’s not organisations, but the people within them that change. It’s not surprising that a strong link is made between organisational change projects and business results. The connection between any strategy, process or system change and the resulting business achievements is the sum of individual changes that happen person by person in the team. So if you can understand what is needed to enable change at an individual level, the key to organisational change is within reach. This is individual change management. Organisational change management and individual change management are both pre-requisites for the successful management of change. But what are the core building blocks for individual change? Follow up and review to ensure the change is embedded and sustained. Making sure all of these items are in place is fundamental to a person achieving and sustaining any change. Both their order and completion are of importance in making change stick. It’s for this reason that simply sending someone on a training course won’t make change happen. Team members need to know why the change is important, what is in it for them – and the consequences of not changing? They must also be convinced that the pace of change will mean that they have the necessary time to take it on board – some people will be quicker than others! 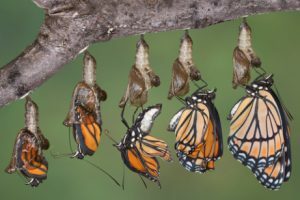 In the end, successful change depends on the entire organisation embracing the need, the benefits and the process, then adopting new behaviours to deliver the different business outcomes that are being sought – and for this to be reinforced until it becomes “the way we do things around here”. With this approach to individual change management, organisational change management models can now be applied more effectively and more deliberately. In other words, without a method for measuring success at an individual level, organisational change management approaches are never as effective. Lasting and successful change is not achieved simply by completing these activities. As managers of change our goals, and what we can subsequently measure, are the outcomes of awareness, desire, knowledge, ability and reinforcement. Our behavioural coach approach underpinned by DISC products is a powerful facilitator of change in individual behaviours – it helps people understand how they can better interact with others to get to the desired outcome, creating a win-win result for all involved.